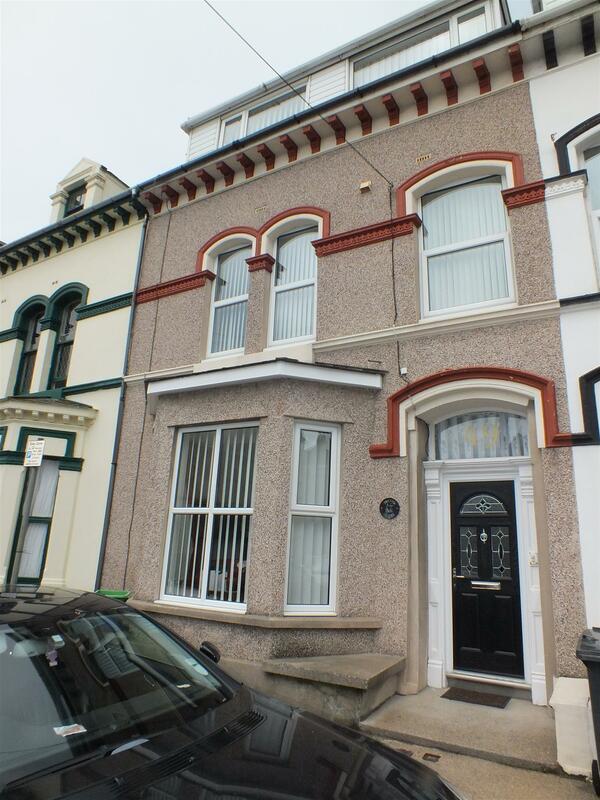 Large Mid Terrace House Located just off Douglas Promenade. Walking Distance to Town Centre, Finance Sector & All Amenities. Offering Exceptionally Spacious Accommodation Over 3 Floors. Excellent Potential to Create Annexe Accommodation. Good Sized Lounge / Dining Room plus Sitting Area. Fitted Kitchen, Utility Room, Separate WC on Ground & 1st Floor. Master Suite with Bathroom and Dressing Room. 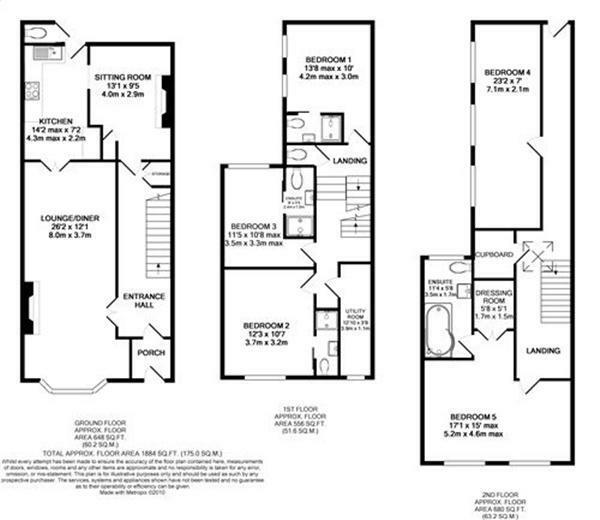 4 Further Double Bedrooms (3 En Suite). Travel along Douglas Promenade from the Sea Terminal, passing the Gaiety Theatre and Villa Marine Complex. Continue straight ahead through the traffic lights at the bottom of Broadway, taking the first left into Castlemona Avenue. The property can be found half way along on the left hand side. A good quality uPVC entrance door with decorative leaded panes leads into the porch. Original coved ceiling. Built in cupboard housing the electric fuse boxes and meters. Fitted matting. Glazed panelled inner door. Ornate coving with original arch and corbels retain a period feel. Stairs with open seating area beneath lead to the upper floors. Coat storage. Glazed, double doors lead into the lounge. A spacious open plan room once again having an ornate coved ceiling. There is a large uPVC bay window to the front elevation providing an excellent degree of natural light. Television and satellite point. Glazed double doors lead into the kitchen. Fireplace with a wooden mantle and recessed 'Dimplex Optimist' electric fire with flame effect. Fitted with a range of matching high gloss, white wall, base and drawer units with a frosted glazed unit. Background tiling complements the dark worksurfaces which also incorporate a stainless steel sink and a four ring ceramic hob with a pull out extractor above and inset 'Samsung' oven below. Integrated dishwasher and fridge freezer. A large sky light provides plenty of natural light into the room. Partial tongue and groove panelling. Coved ceiling. Smoke detector. Tiled floor. Door to a covered outside storage area and WC. Clear opening to a second sitting area / study. Having a brick built open fire and built in storage cupboards. Coved ceiling. Television and telephone points. Glazed door to the hall. Coved ceiling. Smoke detector and fire alarm. Access to a separate WC and utility room. Stairs with inset lighting continue to the second floor. A good sized double room with two uPVC windows to the side elevation. Coved ceiling. Smoke detector and fire alarm. Television point. Sliding door to the shower room. Tiled walls complement the white suite comprising pedestal basin, push button flush WC and cubicle with 'Triton Cara' electric shower and folding doors. Recessed shelving. Wall mounted mirror and shaver light. 'Newlec' extractor fan. Tiled walls. WC. Small obscure glazed window. Coved ceiling. A double room with a uPVC window to the rear elevation. Coved ceiling. Television point. Door to the shower room. Primarily tiled and fitted with a coloured suite comprising WC, pedestal basin and cubicle with a 'Gainsborough' shower and folding screen. 'Aidelle' extractor fan. Coved ceiling. Shaver point with mirror and light. Vinyl floor covering. A naturally bright double room with two uPVC windows to the front elevation. Coved ceiling. Television point. Sliding doors to the shower room. Having predominantly tiled walls to complement a modern white suite comprising push button flush WC, pedestal basin and cubicle with a 'Gainsborough' shower and folding screen. 'Addvent' extractor fan. Vinyl floor covering. Built in shelving with a wall mounted mirror, light and shaver point. Ideally located for ease of use, having a uPVC window to the front elevation. Space and plumbing for a washing machine. Fitted cupboards and worksurfaces. Smoke detector. The whole of the second floor has been fully refurbished throughout and offers an ideal opportunity to create a virtually self contained annexe or teenage accommodation. Bedroom 4 was formerly two rooms and the partition wall could easily be reinstated if more bedrooms are required. Having a large skylight. Smoke detector and fire alarm. Large lockable storage cupboard. A half glazed uPVC door leads to the rear yard. Having three uPVC double glazed dormer windows. Ceiling lights. A spacious with double doors leading to a large walk in dressing area with built in shelving, rails and mirror together with a sensor light. Two large uPVC double glazed dormer windows to the front elevation maximize the head height and flood the room with natural light. Two television points. Recessed halogen downlights. Door to bathroom. predominantly tiled walls which complement the contemporary white suite comprising a shaped panelled bath with wall mounted mixer shower and over head rose together with a curved screen. Pedestal basin and duo flush WC. Wall mounted, mirrored cabinet. 'Addvent' extractor fan. Recessed halogen downlights. Tiled floor. Double glazed uPVC window to the rear elevation. Having recently built retaining walls, the enclosed rear yard houses the 'Firebird' combi boiler and oil storage tank. Aluminium steps access the sloping garden above.